First, some before pictures. Okay, they’re partial before pictures since if you look closely, you can see that the chair rail is already installed upstairs. This started so suddenly last weekend that I didn’t think to take true before pictures. A better view of the upstairs. 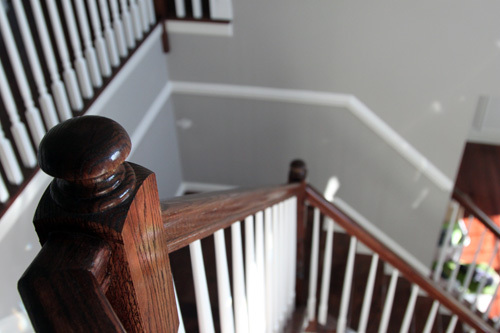 And the staircase angle that drove us insane. 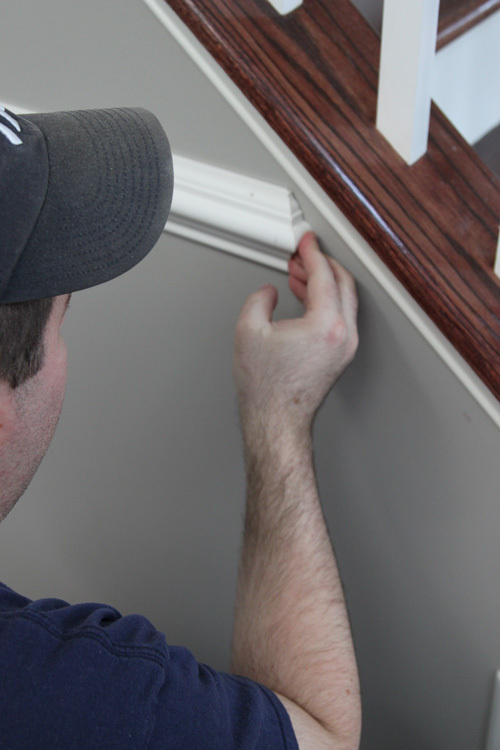 Going into this week, we already had a whole 2 hours of experience in installing chair rail. We knew downstairs included mostly 45 degree cuts, but several things made us nervous. Originally, when we started this project last weekend, we were going to get the chair rail up in the hallway just so that we could start our gallery wall. 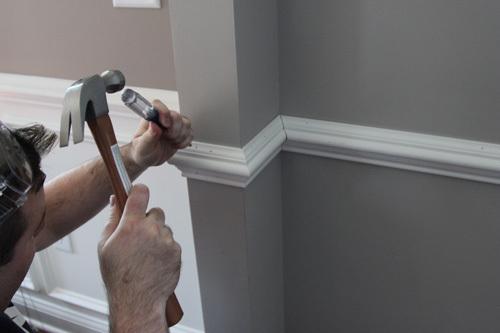 But when we had so much fun with the saw and nail gun, we decided to finish up all of the molding. 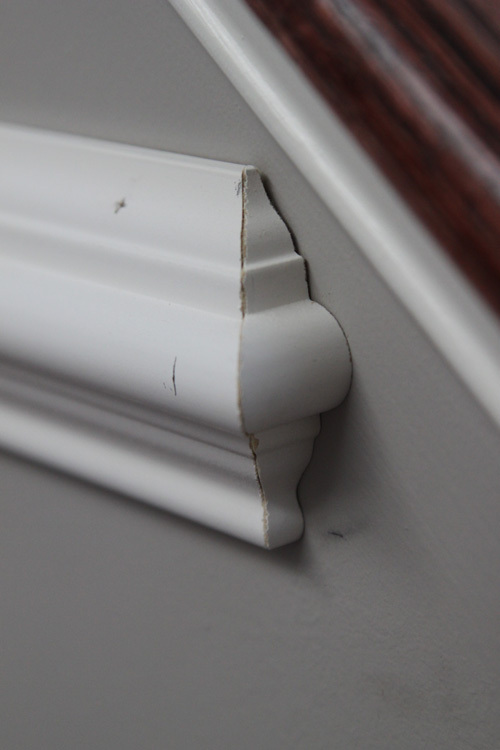 We started by prying off that one piece of pre-existing molding. 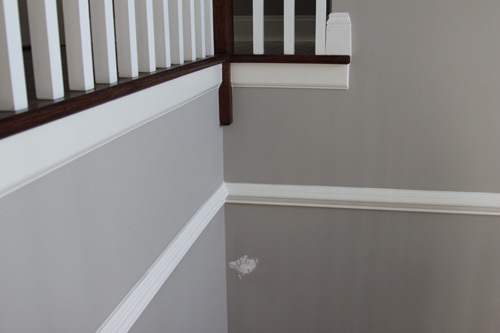 At one point, Mike suggested we just start the new moldings on the opposite side of the wall. But I thought that despite the fact that we had never done this before, we should do it right and connect the pieces along that small wall. So we crossed our fingers and hoped that it would come off clean. 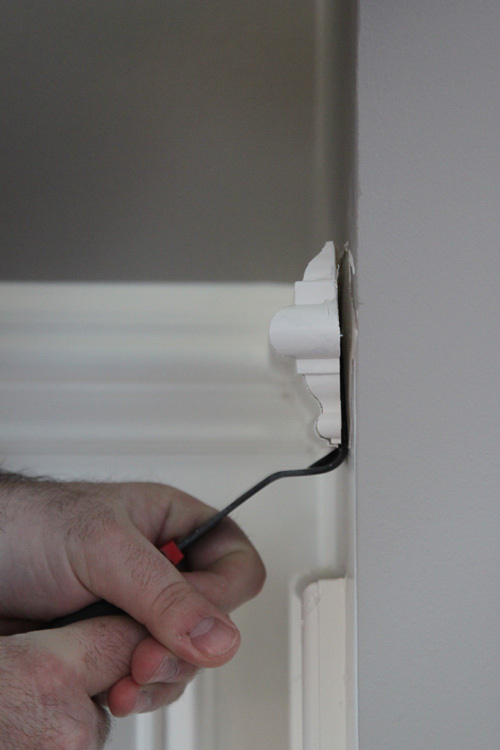 We used our same crappy electric nail gun, which once again didn’t shoot the nails all the way through the molding. So we used a hammer and screwdriver method to drive them fully in. 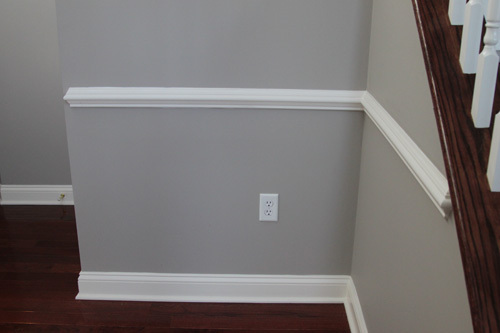 Here’s our little wall all dressed up, before caulk. We’re so glad we decided to do that little wall. It’s my favorite part of the project now! 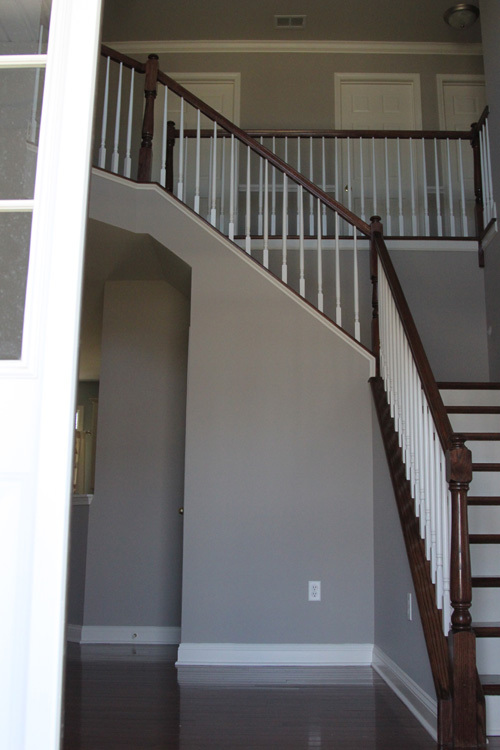 Our second beast was the stairway angle. Once again, I didn’t take any in-progress pictures, probably because it would have just been images of Mike and I staring at each other. But here it is once we finally got it up there. 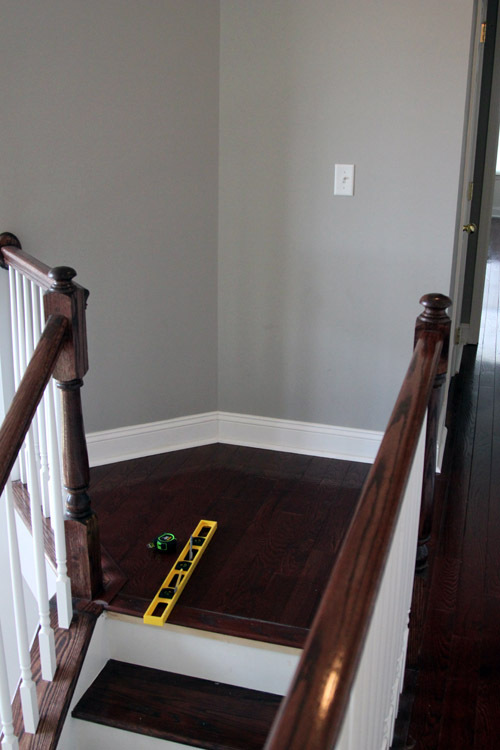 We decided to keep the height of this chair rail consistent with the other areas, which was 33.5 inches from the floor to the bottom of the rail. We debated whether to line it up with the railing, but decided to keep the measurement. It’s pretty close to being in line with the railing anyway! 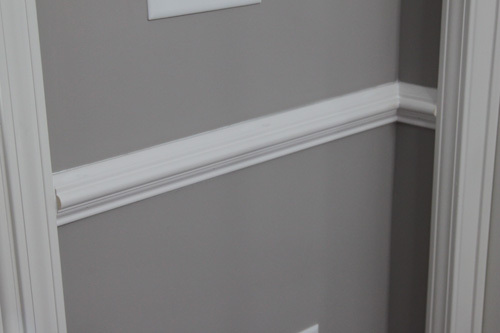 I measured 33.5 inches from the bottom of the baseboard, in several places, then connected them with a pencil line. We disagreed about how the end of this piece angled piece should be cut. 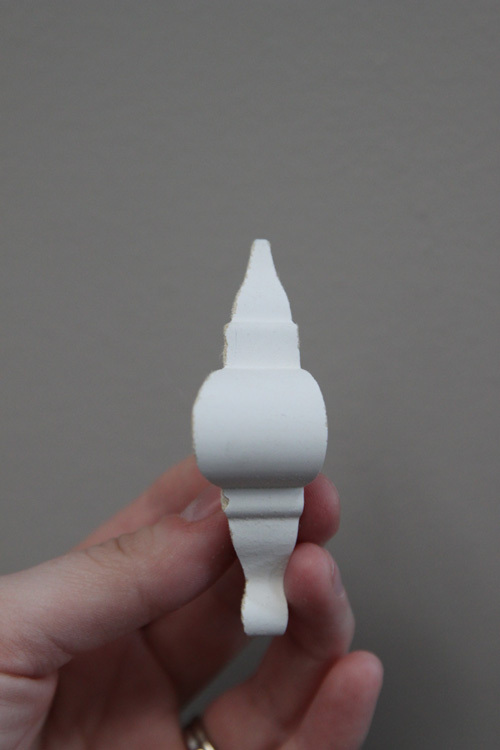 We ended up going with my suggestion of keeping the cut consistent with the other end pieces. Mike thought that this would look funny because it would not meet the railing at the same angle- there would be more open space at the bottom then there would be at the top. 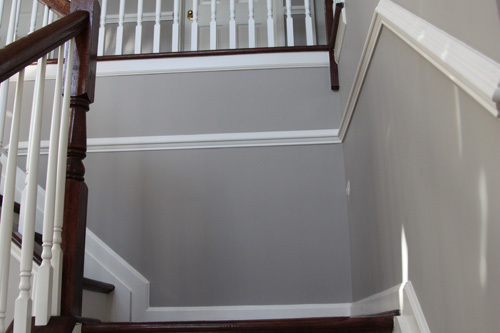 But I figured that once the bottom half of the wall is painted white, that part wouldn’t be noticeable. I was more considered about the funny pattern that would result from cutting this particular rail at a different angle. Finally, we tackled the super scary end pieces. They were the easiest thing ever. Ever. I don’t know why they scared us. In fact, we had loads of scraps around and didn’t even have to cut some of them. They just required a 45 degree cut, then the other side was a straight cut from the point where the 45 degree angle ended. Here’s a piece. 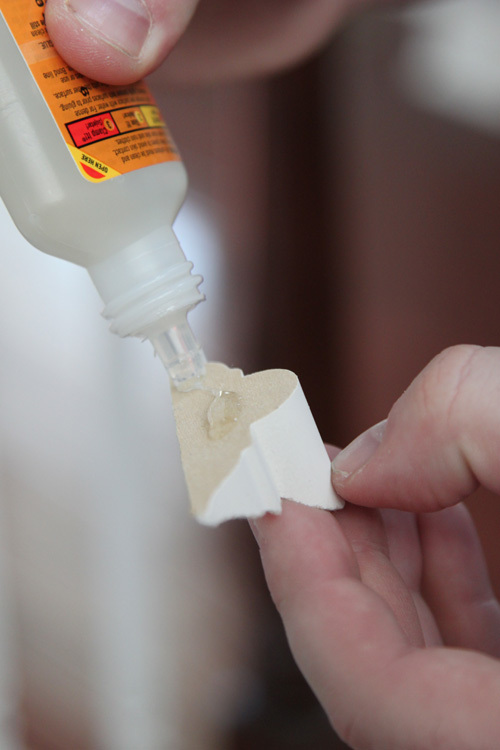 We actually attached these with Gorilla glue, since our nail gun isn’t the best and these pieces are small. 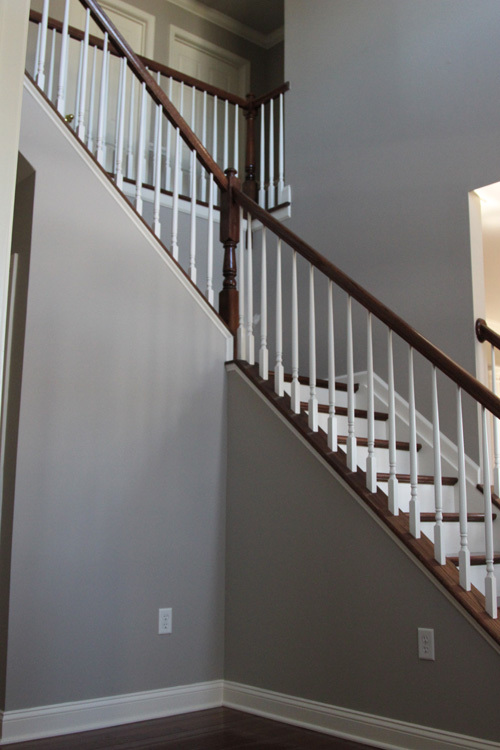 We really couldn’t believe how easy these were to install, yet they add such a pretty effect! Finally, yesterday morning we caulked. I have never caulked before in my life, but we managed to get the entire downstairs finished. 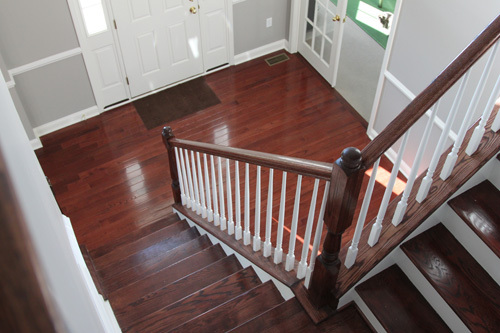 We still have some work to do upstairs, since we have to do the baseboards up there from the hardwood floors we had installed this past fall. All it took was a quick line of caulk, a wipe with my finger, then a few wipes with a wet cloth to get any excess off of the walls. Tada! 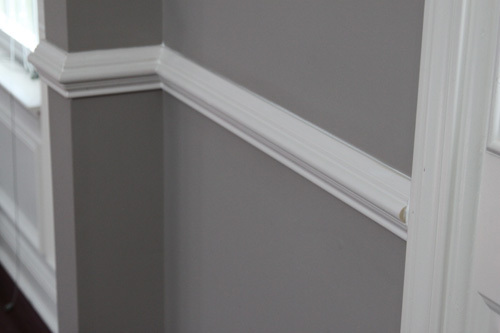 Here are some pictures of our finished (but not painted) chair rail! I think to say I love how this is turning out would be an understatement. I cannot wait for next Saturday to paint the trim and the lower half of the wall a glossy white, then eventually add the boxes underneath, then down the road add the gallery of pictures I’ve been dreaming of. So, is it Saturday yet?? ps- I’m linking this post up to How To’sday at The Lettered Cottage and Thrifty Decor Chick’s Before & After Party! 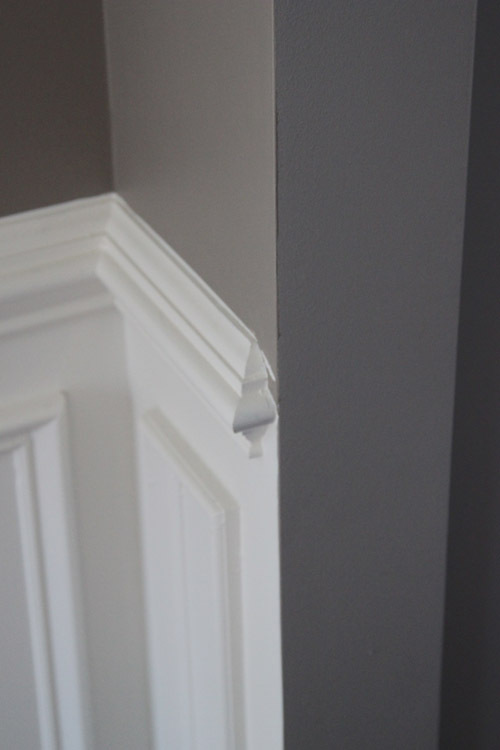 Rebecca and I have always loved molding in a home. 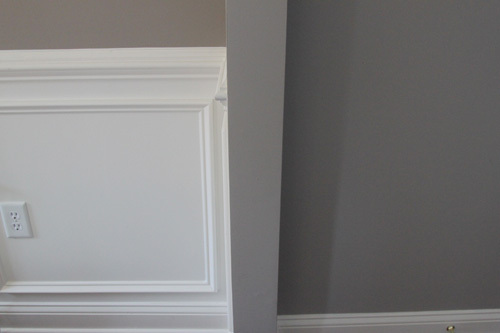 Whether it was crown molding, large baseboard molding or bead-board wainscoting, we were in love with it. 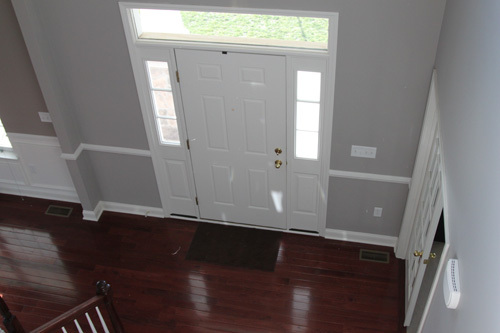 For me, there was something about the clean lines it presented and the overall framing of the room. 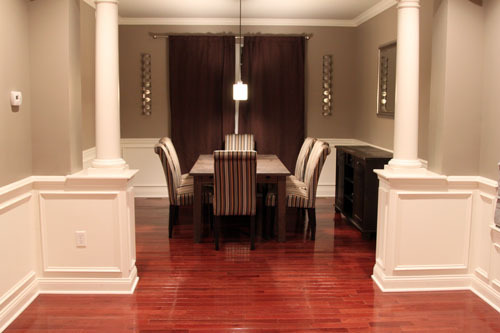 It is a great finishing touch that can ultimately transform a room. 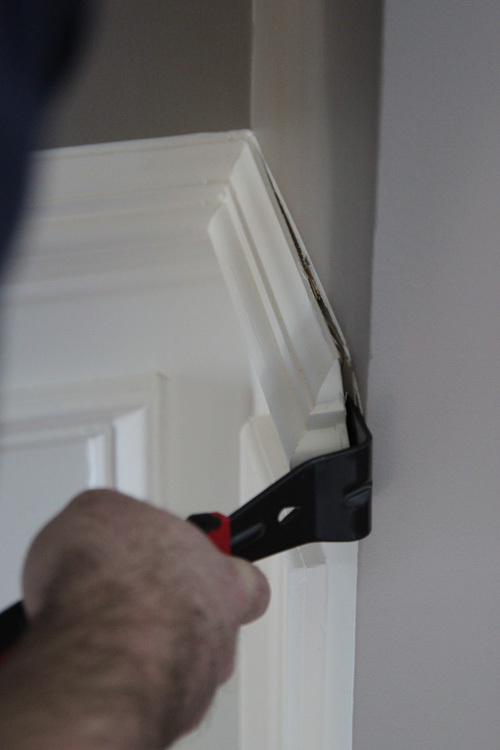 We always talked about doing our own molding, but it was something we were scared to do ourselves. How do we do the corners, how do we make the cuts, will I cut my hand off using the power saw — all scary questions that ran through my head. 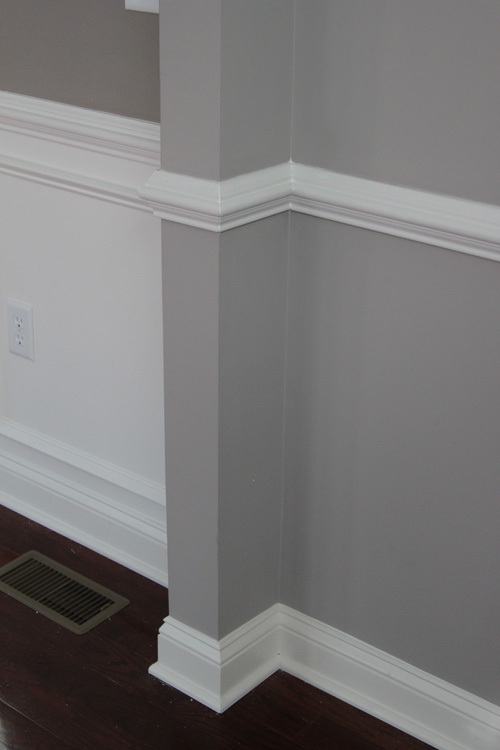 We previously had a friend of the family install some molding in our formal living room. 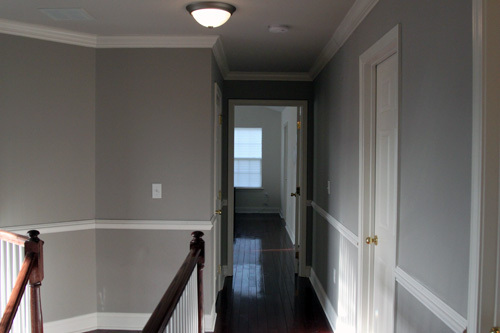 Our plan was to eventually bring the molding into our foyer area, up the stairs, and the upstairs hallway. 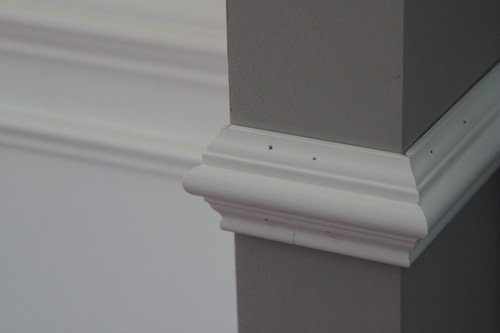 So when I told Rebecca earlier in the week that I had an itch to do a chair rail, she kind of shrugged me off thinking it was just another molding conversation that would soon pass. But when we woke up Saturday morning, we began passing along ideas to accomplish during the day since we both felt somewhat motivated. Rebecca mentioned hanging some curtains and I mentioned the chair rail. 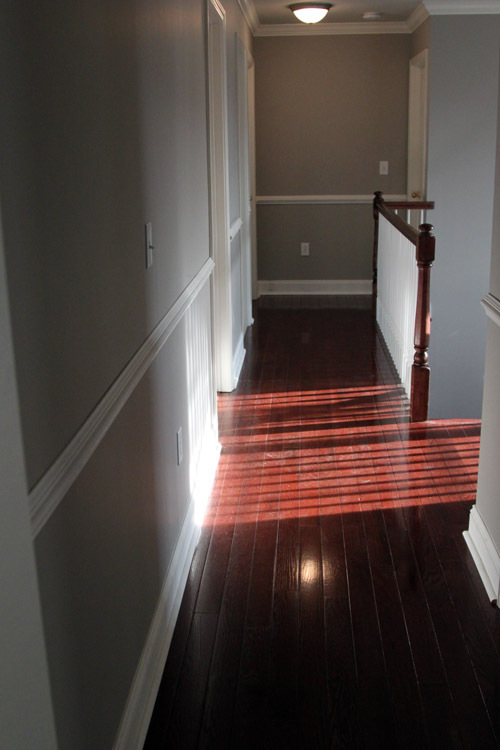 We decided to start with the upstairs hallway since it would be the easiest in terms of straight cuts and easy angles. We made some measurements and a couple minutes later, we were on our way to Lowe’s to pick up some molding. 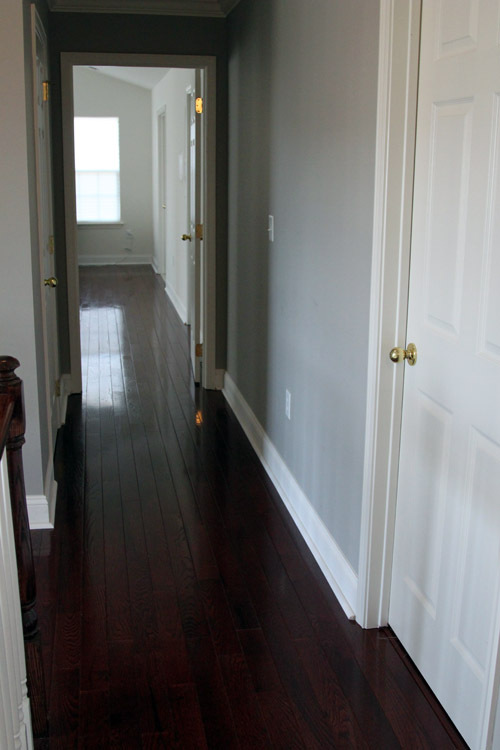 Here is the view looking down the hallway and into our master bedroom. 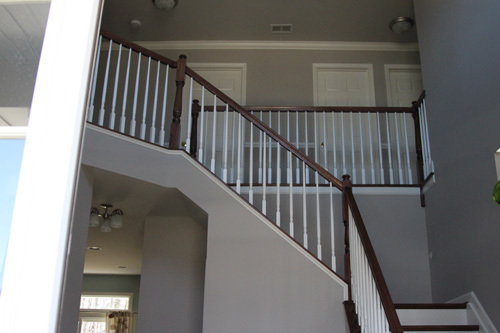 The plan here is to put up a chair rail and then eventually do boxes; similar to our living room in the picture above. Everything is pretty straight so cutting+nailing would be pretty straight forward. This was so until we got to an angle at the top of our stairs. We struggled with this for maybe a half hour or so. We could not figure out how to make this cut. We tried several different cuts, holding them up and trying to determine how to do this. We went back and forth a bit before I went downstairs to draw the angle on paper and try to calculate some numbers. And just when I was about to lose my patience, Rebecca figured it out. We made two cuts with some scrap, one angle at 20 degrees and the other at 25 degrees. We held the pieces together and sure enough, we were golden. A few more finishing cuts later, and we were finished. So what did I learn with this experience? We waited just about a year to do this project because we were scared. We were scared for absolutely no reason. Invest in a nail gun with a compressor. We used an electric nail gun and half our nails barely went completely in. We had to hammer a lot of them flat with the surface. Take your time. Measure twice, cut once. Or if you have scrap pieces, make some cuts as an example and work from there. The molding area at Lowe’s isn’t scary nor overwhelming. 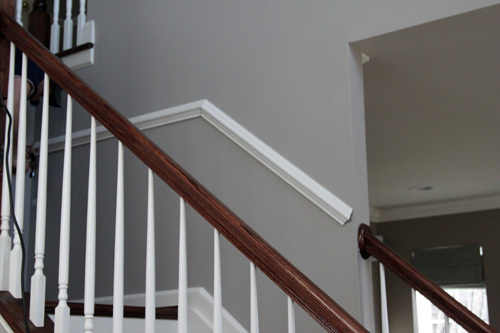 I categorized this post as inexpensive design because this was an incredibly cheap project to accomplish — especially compared to what we would have paid a contractor. All said and done, 40 linear feet of molding and some tubes of caulk ran us just under $100. An absolute steal.